One of my all-time favorite artists is Cai Gou-Qiang. Maybe it’s his inventive use of explosives as an artform or the massive installations that I was confronted with at his Guggenheim show a few years back. Had I not been so overwhelmed by the artwork I would have noticed this pop-up card in the gift shop where it was distributed by Gallery 91. 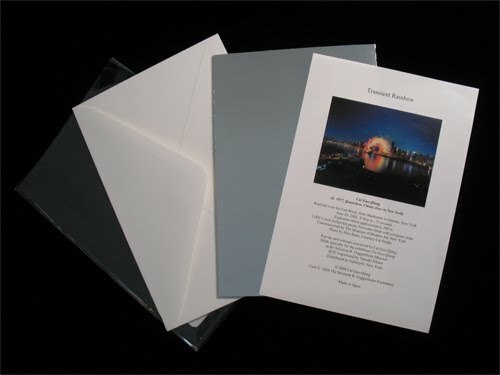 This movable card showcases a 15-second fleeting moment that occurred over the East River in New York on June 29, 2002. 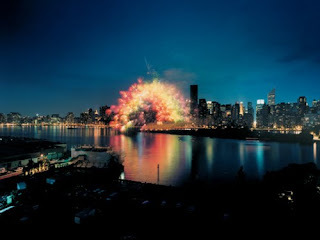 Transient Rainbow employed 1,000 multicolored peony fireworks to suspend a vivid rainbow against the dark New York skyline. With the reflection from the water, you get the impression of the always inspiring, double rainbow or circular rainbow. You can see more images and even a video from the event on his website by scolling down through his 2002 projects. 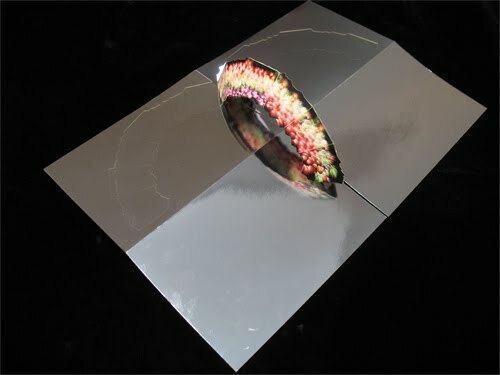 The pop-up card itself is a four panel hinged reflective foil base that flattened out to represent the shimmering water under the rainbow that swings on a v-fold to complete the familiar arch. It was conceived by Cai Gou-Qiang and created by Japansese paper engineer Takaaki Kihara, a disciple of Masahiro Chatani and a well-known figure in field of origamic architecture. The design aesthetics are similar to his other works where the pop-up elements are cut and constructed from a single sheet of paper leaving a symmetrical pattern in the base page. This interesting artifact does not qualify as a vintage movable, but it is a rarity and I felt it needed a closer review, much like the rest of Cai Gou-Qiang’s work.